The tactical bot was used in SWAT missions for years. Now, its parts will aid Glencoe High School's robotics team. This week, students at Glencoe High School got a gift unlike any other: Their very own SWAT tactical robot. On Tuesday, Washington County Sheriff's Office deputies donated a decommissioned tactical robot to the high school's robotics team. Since 2012, the students in the school's robotics club have been building and designing robots, which compete in competitions across the country. Glencoe's team, officially known as Team No. 4488 but better known as "Shockwave," is part of FIRST, an international robotics program that has been challenging students with robotics competitions for nearly three decades, promoting technology, math and engineering to students of all grade levels. The team has made it to the robotics World Championships more than once, bringing home big wins, including a silver medal finish in 2014. The robot, a Mini Andros II by Remotec, was first purchased by the Sheriff's Office in 2006. Equipped with cameras, two-way communications and a robotic arm, the bot was used in dozens of SWAT and other calls across Washington County over the past decade, according to the sheriff's office, and was used to remove weapons, open doors and assist deputies entering dangerous area. "The Mini Andros II has been an essential part of our operation throughout its many years of service," said Sgt. Mark Trost. "This unit has in part saved lives during various missions during its lifecycle. Our team is excited to see that it can continue to be of value to our community and as an educational tool for local students." In 2008, the county created its remotely operated vehicle team to oversee maintenance and operation of the department's robots. Today, the group is made up of Sheriff's Office patrol and jail staff, handling three tactical bots. "At the time (the Remotec bot was purchased), use of such technology by local law enforcement was a relatively new and innovative concept," the Sheriff's Office said. When it came time to decommission the robot this year, the agency's robotics team knew where to take it, sheriff's office officials said. "Over the years, robotics technology has drastically improved and replacement parts for the Mini Andros II have become scarce," said WCSO. 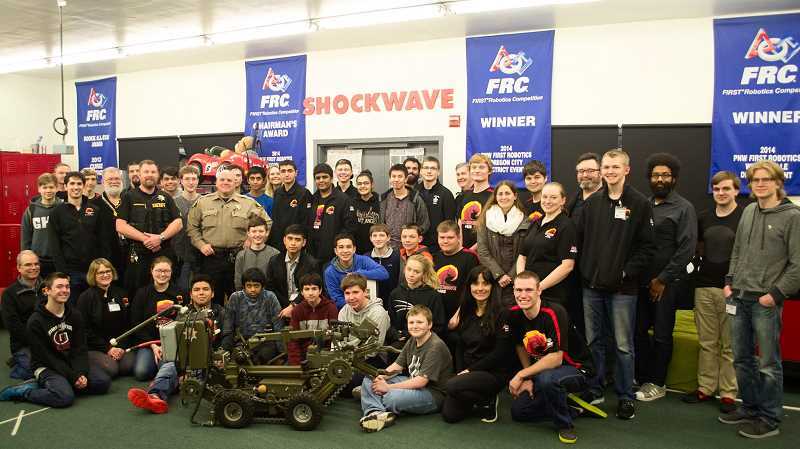 Deputies had met the Shockwave team at a robotics convention the year before, and knew the bot could be used as a teaching tool for the students. The robots parts will be used in future projects, according to the department.